Swirling phytoplankton blooms highlight this satellite image of the North Altantic Ocean in 2010. The swirls may be a key factor in the blooms. Every spring, waters in the North Atlantic Ocean explode into green and white patches as countless microscopic marine plants bloom. The burst, scientists had assumed, is fueled by longer days, more sunlight, and warmer waters. But a new study has revealed a previously unknown mechanism that triggers the bloom weeks before the sun begins to warm the ocean. The jump-starters are eddies, or swirling whirlpools of water. These eddies prevent phytoplankton from dipping into deeper waters and instead keep them trapped near the sunlit surface where they can grow, said Amala Mahadevan, a physical oceanographer at Woods Hole Oceanographic Institution and lead author of the study, published July 2012 in the journal Science. The discovery rewrites the textbooks for a seasonal phenomenon on which the entire North Atlantic food web depends. The bloom also has mammoth implications for climate. Marine photosynthetic plants absorb enormous quantities of carbon dioxide, helping the oceans store about one-third of the heat-trapping CO2 we put into the air each year by burning of fossil fuels. Mahadevan’s co-authors, Eric D’Asaro and Craig Lee of the University of Washington and Mary Jane Perry of the University of Maine, were in the storm-lashed North Atlantic in April 2008, using floats and gliders to track the formation and progression of the bloom. They measured the ocean’s temperature, salinity, currents, oxygen levels, and nutrient and phytoplankton concentrations. 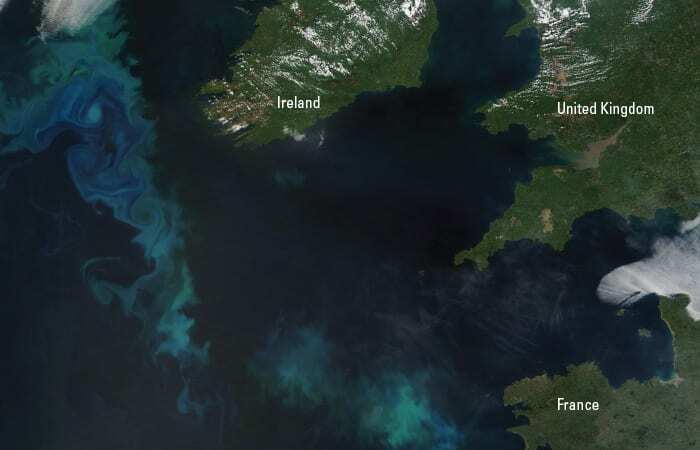 During cold, dark winters, storms roil ocean waters, stirring phytoplankton into the depths. In spring, storms diminish and the sun begins to warm the ocean surface, creating a stratified layer of warmer, less-dense water that traps phytoplankton near the surface, where they are exposed to the sunlight they need to grow. But to the scientists’ surprise, their glider measurements showed that phytoplankton were blooming even though ocean waters were getting colder, not warmer. “It was apparent that some new mechanism, other than surface warming, was behind the bloom initiation,” D’Asaro said. Mahadevan, who runs computer models of evolving oceanic processes, recognized in her simulations how eddies stratify the sea surface and could trigger blooms. Using data from her colleagues’ study site, her models confirmed that eddies were the underlying cause of the stratification and blooms that they saw. “Our results show that the bloom starts through eddies, even before the sun begins to warm the ocean,” Mahadevan said. The eddies, they concluded, form stratified layers of warmer water near the surface that sustain phytoplankton in sunlit areas and launch their growth spurt. The newly discovered mechanism helps explain the timing of the spring and summer bloom, known to mariners and fishermen for centuries and clearly visible in satellite images. It explains why the blooms have a patchy appearance: They are shaped by eddies. And it offers key understanding to predict blooms and learn how they may change in the future.